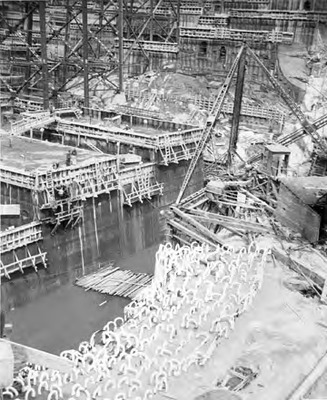 Portions of the foundation level of Grand Coulee Dam have been poured, others remain to be poured. In the foreground, cooling coils are visible. These were required to maintain the desired temperature for optimum curing of the concrete. Copyright status is unknown and has not been evaluated. Users are responsible for assessing and/or securing use permissions. For further information, contact Eastern Washington University Libraries, Archives & Special Collections, http://www.ewu.edu/library/services/archives.xml.